Heat gas or charcoal grill. In large bowl, combine ground beef, sausage and 1/4 cup pasta sauce; mix gently. Shape mixture into 4 patties, 1/2 inch thick. When grill is heated, place patties on gas grill over medium heat or on charcoal grill 4 to 6 inches from medium coals. Cover grill; cook 11 to 13 minutes or until meat thermometer inserted in center of patties reads 160°F., turning once. During last 1 to 2 minutes of cooking time, place cheese on patties; cook until melted. Heat oil in 8-inch nonstick skillet over medium heat until hot. Add bell peppers and onion; cook 4 to 5 minutes or until tender, stirring frequently. Place patties on bottom halves of buns. Top each with 1/4 of bell pepper mixture and top half of bun. Serve with warm pasta sauce. To broil patties, place on broiler pan; broil 3 to 4 inches from heat for 10 to 12 minutes or until meat thermometer inserted in center of patties reads 160°F., turning once. During last 30 to 60 seconds of broiling time, place cheese on patties; broil until melted. If your Italian sausage has casings, remove them before cooking. 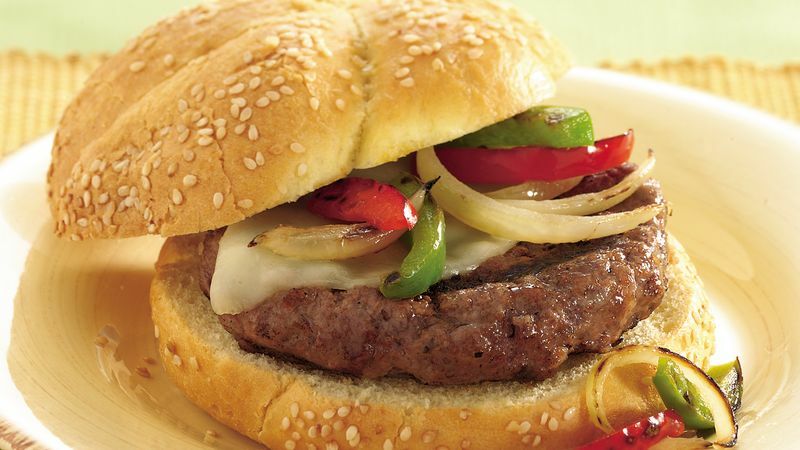 To toast the burger buns, place them, cut sides down, on the grill for 1 to 2 minutes or until toasted. Pick up an antipasto salad from the deli to serve with these extraordinary burgers. Keep the Italian theme alive by serving spumoni ice cream for dessert.